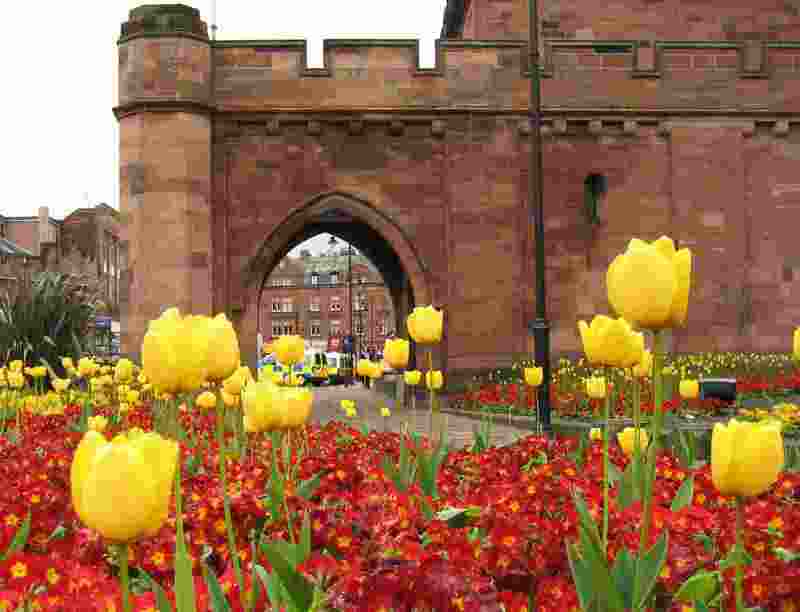 Carlisle was once home to the Danes and the Romans, and more recently it's been at times Scotland's most southern city and one of England's most northern. Bonnie Prince Charlie captured it, and Mary Queen of Scots was imprisoned here. A few miles to the east is the start of Hadrian's Wall, which the Romans built to separate the conquered part of Britannia from the less-conquered part. The wall's path runs roughly west-to-east, approximating today's border between England and Scotland though somewhat to its south. Yet it wouldn't be quite right to say that England was Roman-controlled and Scotland was not. The Romans had numerous garrisons and settlements in Scotland extending as far north as Inverness. Sister city to Carlisle on the west coast, is England's eastern city of Berwick-upon-Tweed on the North Sea coast. (Berwick is pronounced Berrick.) This city has a particularly ambiguous location in that the River Tweed forms the natural border but the city straddles it. In 1482, the border was adjusted to run north of the Tweed by enough to keep the city within England, made possible by constructing some notable walls. Of course, this border adjustment was the culmination of nearly two centuries of war during which the city changed hands 13 times, rivaling Jerusalem in this regard. What do the locals think of all this? Well, these days, due to its location, the Berwick Rangers based in England play football in the Scottish league! I bought a new cellphone ("mobile phone" as known locally) in Carlisle at its large and yet cozy central square. The folks at Phones4U were nice and they were quick. I was on my way from the main shopping area in not much more than a half-hour, equipped with a basic and small Motorola phone and some prepaid time on T-Mobile. Leaving town, it started to drizzle. When all shelter was totally behind, drizzle turned to rain. At this point, I got in a road situation that I hadn't met before. A single route was available (the A74) carrying all travelers to a single bridge over the River Esk. Further north, the A74 has been upgraded to a freeway, the A74(M), with the M signifying motorway. South of Carlisle there's the M6 freeway. Per British roadbuilding policy, all freeways have a nearby non-freeway for local traffic, which also provides a pedestrian and bike route. But there was no freeway yet between Carlisle and Gretna. They’re working on upgrading the A74 – and one day there'll be both a freeway and a parallel route for pedestrians and local traffic. But, at the time I walked it, the only road was the A74 with the traffic of a freeway, no pedestrian amenities - and ongoing construction to turn it into a freeway in the future. It's quite a large project (£180m, $360m). Any hope of walking off the road was dashed by a wide swath of construction mud (second day of rain) extending from the edge of the shoulder for a hundred yards or so. This would seemingly confine me to a two-ft strip of highway between the edge of the nearest lane and the temporary barrier fencing off the shoulder on which the crews were working. But I was not suicidal. Trucks were flying past in the rain, their slipstreams a mass of spray, easily impacting me and affecting the visibility of vehicles behind. So, to get further away, I jumped the construction barrier and walked on the shoulder that was being upgraded to the extra lane, with the hundred-yard sea of construction mud on one side of me and the construction barrier on the other. My path was now a nightmare. The shoulder I walked was muddy and greasy, and uneven, and it abounded with temporary road signs that blocked my path. They came up every hundred yards or so for nearly five miles. There were signs saying Exit Closed, Free Rescue - Stay in Car, Diversion, Lane Closed, Works Exit, Construction Vehicles Merging, No Stopping, 50 mph, and many more besides. These signs were too low to get under, and were generally wide enough to occupy the whole width of the shoulder. So most signs caused me to have to descend two ft into the construction mud, and climb back after the sign. And there weren't just signs blocking the shoulder: there were also surveying instruments, pipes, rubble, traffic cones, and guard rail sections. It would have been quite horrible in the dry, and it was a nightmare in the rain. At one point, I got a moment of shelter from the wind when a wall temporarily appeared. This brought home to me just how strong the wind was, blowing from the Solway Firth just to the west. It was positively battering me, unnoticed as I focused on my path, the rain and the traffic. Fortunately, the wind blew the vehicles' wet slipstreams away from me - perhaps it was good that I was on the left side of the road, which was caused by my inability to cross to the usual right side under the prevailing conditions. Having encountered this situation, there was absolutely nothing I could do but get through it. Fortunately the hard-hatted construction crews were not also hard-hearted. Sometimes they waved me through some work areas instead of making me wait. Most of the time they were sitting in their vehicles and earthmoving equipment cabs waiting for the weather to improve. Thus I reached Gretna where the road became an official freeway and offered pedestrians a mandatory exit on to local roads. 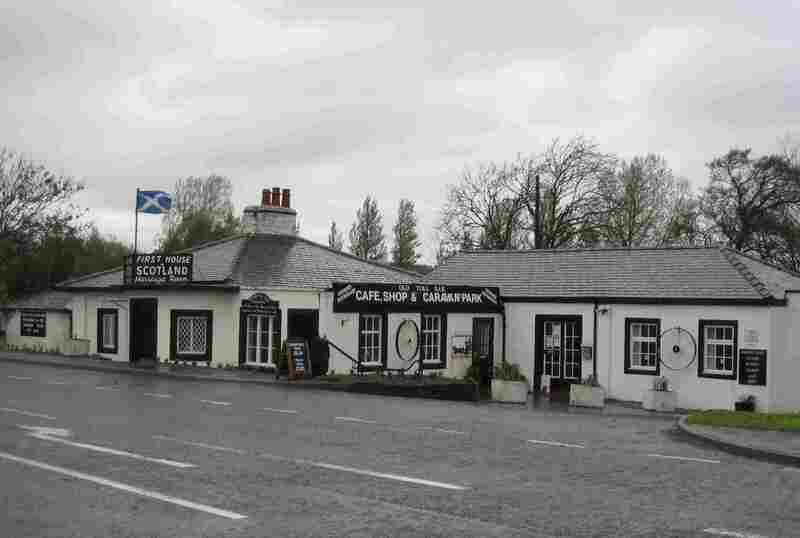 Gretna (or Gretna Green) is well known as the place just in Scotland where the English were able to get married quickly without English formalities. The village blacksmith and other places performed the ceremony. Today, they've created a tourist destination out of Gretna, giving it a theme park feel. I stopped in a Subway restaurant to survey the damage, and eat a Veggie Delite. My boots were wet on the outside but not on the inside. If ever there was a day that I was glad of these boots, it was today. My backpack contents were dry, mainly because I'd used a thick plastic liner. But I myself wasn't dry - and my electronic belly pack wasn't as dry as I'd intended with its "waterproof" cover, and the restaurant seat and floor quickly got wet from my "run off". I decided to stop in Gretna, and preferably in a hotel with heat to dry my clothes and gear. I approached the reception desk at one posh establishment clearly trading on Gretna's historical associations. There, a flunky in full-dress Highland regalia - and a foreign accent, by which I don't mean Scottish or English - laughed at my bedraggled appearance. He quoted a price of about £135 ($270) for the room and breakfast, which I reckoned was mostly to pay for his uniform. So I asked for "the hiker's rate", to which he replied, "We don't have one". Then I couldn't resist asking if they had a "tired hiker's rate", to which he more emphatically replied, "We don't have one". Then I just had to ask if they had a "tired, wet hiker's rate". At this point, the look in his eye indicated I had better leave before he threw me out, though I wasn't seriously concerned because I reckoned he'd get his sporran all caught up in whatever was behind it if he tried. Anyway, I left at that point, and found an equally nice place down the road where the hostess gave me a tired, wet hiker's rate even without my asking, and there wasn't a flunky. Out of the window, it was blowing a gale but no longer raining. On the TV, they were reporting a clearing trend. My average speed this day was only 1.8 mph, reflecting the tough conditions. The only previous day with a lower speed was the one (day N7) from Callington to Peter Tavy back in Devon, when I wasn’t as fit and had tarried for a coffee in Tiverton and been regaled by a dogfight. From this point on, I never did have a day when I averaged less than 2 mph, and on one day got up to the warp speed of 2.7 mph. I was now in Scotland, nearly 550 miles done and about 400 to go. It had been a very hard slog, and I could have stopped now with honor well satisfied. It's a once-in-a-lifetime experience to walk the length of England. Heck, most people back home don’t know the difference between England and Britain anyway. But I did. I was feeling physically and mentally strong. I'd never have forgiven myself if I had stopped now.